I am getting so much use out of this tote lately! Some days I use it as a purse, but I've also used it to tote around work projects and for a road trip bag. 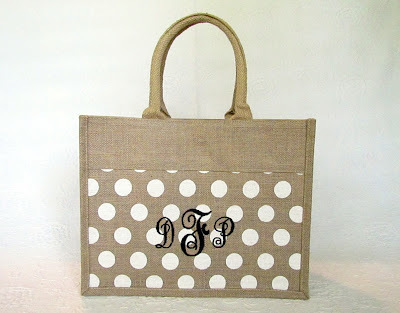 It's cute on it's own, but can be monogrammed with your name or initials. It fits on your shoulder perfectly and is lightweight, but sturdy...trust me, I've loaded it up! Ashley gave me this for my birthday, but you can order one for yourself at Ribbons and Rickrack. Only $30.00 which includes the personalization!